Whether you are a first-timer or a seasoned traveler, having a backpack checklist of all the vacation essentials always helps. You need to prepare a comprehensive and well-planned travel checklist in order to have a great vacation ahead. Chalking out your backpack checklist is challenging. As your trip gets closer, you need to think out so many aspects of your vacation. Also, the choice of luggage becomes an equally significant factor. Traveling with a backpack certainly makes you feel more agile. What with hands-free mobility while moving from one location to another, and all of your essential stuff being within an arm’s reach. Wherever you’re planning to go, select a backpack that is versatile, lightweight, water-resistant, and sufficiently big to hold all your vacation essentials. The most important aspect concerning luggage is an excellent warranty that promises durability into it. The reason is that traveling with a backpack with a broken handle or zipper is sure to land you in deep trouble. The durability of a backpack plays an even greater role if you’re spending your vacation dirt biking. A rugged backpack with several pockets is as essential for a dirt bike trip as a B&B bash plate. Also, backpacks with excellent security features are advantageous. For instance, backpacks having zippers that are lockable with TSA approved locks provide enhanced security. If you are travelling by air, you need to be well aware of the weight and size restrictions imposed by various airlines worldwide. Choose a space-efficient backpack with a larger, rectangular compartment over an unusual, trapezoid-shaped backpack. Keeping everything organized inside your backpack is certainly a challenge. One of the best ways to pack for any trip is to use packing organizers or packing cubes. Packing cubes are small, zippered bags designed to compartmentalize your vacation essentials, particularly to roll or fold clothes, in order to ensure optimum space utilization. Packing cubes are an excellent inclusion in your backpack regardless of its design, i.e. either one massive compartment or two smaller pockets inside the backpack. They also let you know exactly where every travel essential is inside your backpack. While unpacking in your hotel room, you can quickly keep your organizers inside the hotel drawers. Also, these organizers help you pack soon and move smoothly from location to another without the need of rearranging your backpack every time. Packing cubes help you organize clothing and footwear by type, purpose, and condition (e.g. clean or dirty). They effectively reduce the volume of your clothes by almost 80 percent. This is especially advantageous for bulky clothes like sweaters and jackets. Go for layered, lightweight and breathable clothes. Use packing organizers of different sizes to compartmentalize your clothing and footwear. For the basics, pack cotton T-shirts, long-sleeved shirts, pants and shorts. Pack sufficient underwear made of quick-drying fabric. Keeping in mind the cultural sentiments of your vacation destination, consider whether or not to pack casual outerwear like tank tops. For stylish and comfortable evening wear, women should pack long maxi dresses in floral prints. These will instantly make you a style diva! Also, don’t forget to carry a swimsuit, especially if you are traveling to a beach destination. Don’t forget to pack a pair of pajamas which you can pair with one of your T-shirts for comfortable sleepwear. Based on the climatic conditions of your vacation destination, for extra warmth, pack a sweater or a fleece jacket. Also, keep a rain jacket handy. For the protection of the head, carry a wide-brimmed hat or scarf. Comfortable, soft-soled walking shoes should be an ideal choice. If you are planning to go hiking, pack a pair of sturdy hiking boots. Carry 2-3 pairs of socks made of non-itchy and breathable merino wool. If you’re traveling to a beach destination, pack a pair of good quality beach shoes or flip-flops. Basic makeup essentials for women – lipstick, foundation, eyeliner, etc. 5. Personal Items to keep handy – Prepare your personal items bag to make sure you have items like technological devices, a couple of outfits and a few essential toiletries handy while you are on any train, bus or boat rides. This way you don’t need to carry the backpack everywhere you go. For instance, if you need to wear your eye mask, you don’t have to get into your backpack each time on your trip. Consider using a small day pack or ruck sack as your personal items bag. Money belt or hidden pocket – This is a small, zippered pouch that you can wear over your stomach by fastening its elastic strap around your waist. You can tuck it under your pants or skirt and hide it completely from sight. Neck wallet – You can wear this anti-theft device around your neck, under your clothing to carry your passport, credit cards and cash. Undercover Bra Stash to keep credit cards and cash – Women travelers need to simply snap this discrete under-clothing device over their bra straps in order to keep cash and cards out of sight. Leg wallet – Travel comfortably with this cool invention! It’s an undercover wallet that provides you with a sense of security by wrapping around your leg, underneath your pants. Wherever you are headed, make sure you’ll have a great time! In order to make your vacation travel smooth and comfortable, think through your itinerary in advance. This way you’d be able to bring everything you need for your vacation stay. 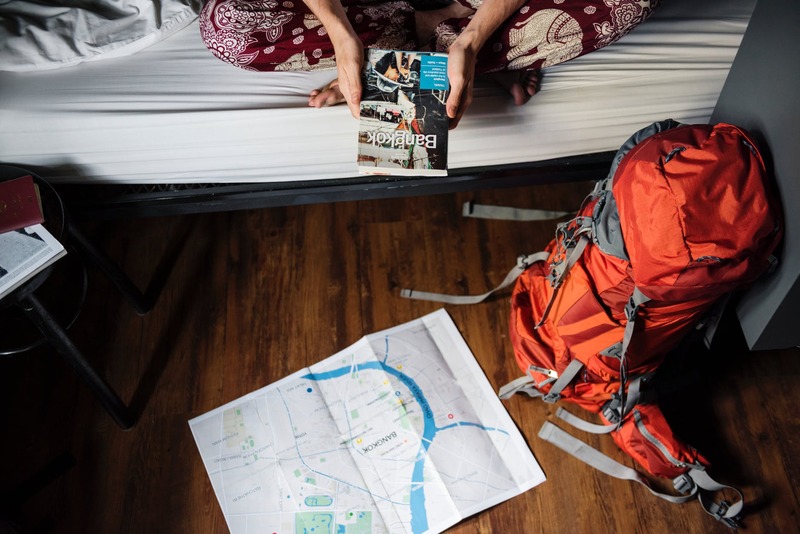 On reading the backpack checklist and tips for selecting an appropriate backpack, get started with packing the right things in the right manner. Pack light, give priority to versatile items, particularly with regard to clothing, and don’t forget to use the packing cubes. Life will be much easier with these organizers. Health and security are of the utmost importance in every aspect of life. So, your vacation travel is no exception and make sure to pack all the essentials. Last but not least carry your travel reservations, identification documents, health insurance, travel insurance information, cash and credit cards properly.